Denzel Washington was recently on Letterman talking about his son who (FYI) plays basketball for Penn. 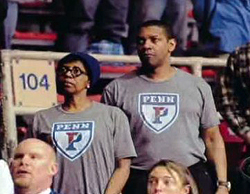 Check out this clip above where Denzel is all about Penn pride! Nice video! It's always great to see a parent so proud of his children. Thanks, Denzel...and Matt for posting.